For a striking example of what else was happening in Italian literature contemporary to Gabriele D’Annunzio, one could hardly find a writer more different than Italo Svevo in his 1898 novel Senilità. Though I read the work two months ago, Senilità proved such a knockout that I’m determined to post about it. 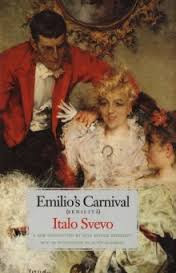 I’ll start with the book’s title, which began as Il Carnavale di Emilio – Emilio’s Carnival - the choice of translator Beth Archer Brombert (the book has been previously translated as the lifeless As a Man Grows Older). However, Senilità appears parenthetically on cover and title page to acknowledge Svevo’s insistence that this, the book’s original published title, was indispensable. In the book’s introduction, Victor Brombert argues that “carnavale,” with its etymology rooted in “denial of the flesh,” better conveys the work’s central thematic concerns to English readers on whom the nuances of the curious word “senilità” might be lost. Brombert defines the term, in the context of Svevo’s writings, as a kind of “ironic ennui…a permanent premonition of life as disaster, a deep skepticism concerning one’s own potential, a ceaseless mediation on vulnerability and death, a wisdom that can be put to no use…” – well, his catalogue of approximations goes on. Would it not have been better to make her less honest and more calculating? Once he asked himself the question, he had the brilliant idea of taking upon himself the education of the girl. In exchange for her gift of her love, he could give her only one thing: an understanding of life and the art of enjoying it. Emilio thinks of Angiolina as “Ange” while in this mode, yet quickly shifts to an opposing pole of moral indignation and jealousy concerning any attention this young allumeuse gives to other men, whose antennae clearly pick up on the glances that go everywhere, perhaps indicating even her availability. Emilio’s conflict is amplified by his admiration for and envy of a debonair and worldly friend, Balli, a handsome sculptor, who warns Emilio away from the “vulgar” Giolina though is not himself immune from her pull. Finally, Emilio must also navigate the psychological tensions his new relationship creates with Amalia, the lonely, homely sister with whom Emilio has lived and cared for since their parents’ death. Between this domestic obligation and the thirst for adventure, the duties of office and aspirations of art, and especially between sexual desire and a compulsion to justify it both morally and socially, Emilio inhabits a solipsistic shadow-land of indecision, impulsiveness, and self-absorption. In thrall to Angiolina, he ignores Balli’s advice. He ignores his sister’s needs, with devastating results. Having written one unpublished novel – “the story of a young artist whose health and talent had been ruined by…a heroine in the style of the time: part woman, part tigress” – he lets his writing languish, turning all of his attention to making headway with Angiolina while alternately condemning her for not being the woman he expects her to be. In the distance he thought he saw her again. A reflection, a shadow, a movement, everything took on the shape and demeanor of the phantasm that eluded him. He started to run, hoping to catch up with her, not calm and ironic as he had been on the slope of via Romagna, but firmly intent on becoming violent with her. Happily, it was not she. In his misfortune, Emilio felt as through all the violence he had been about to unleash on her was now directed to himself, leaving him breathless and without hope of reason or control. He bit his hand like a lunatic. As one might expect, none of this mental tumult ends well for the parties involved. One would be unlikely to want to read the novel Emilio might have constructed from his experience, as the insipidity of so many of his ruminations, by themselves, would be nearly unreadable. But the authorial distance Svevo imposes upon his poor author allows us to see both how Emilio might have written his own story and how he would have gotten it wrong, an ironic detachment and sentimentality that eclipses an ability to see himself as he is. In addition, the patient arc of Svevo’s vision cements Emilio’s tortured thoughts together at this remove, creating an indelible portrait of a soul wrapped up in illusion, aware of it only in intermittent glints and glimmers, yet unable to achieve the action necessary to surmount his own weaknesses. Fortunately, Svevo’s exquisite novel triumphs in Emilio’s place. It’s small wonder that James Joyce, who promoted the literary career of Svevo after discovering the writer in one of the English classes Joyce taught in Trieste, admired the novel so much that he could recite its final pages from memory. One can imagine a young Emilio serving as the model for the young boy in Joyce’s “Araby,” burning with shame at having his romantic illusions shattered. Yet he is no young boy, and it would be difficult to imagine any epiphany truly taking hold. This book is kind of a hard sell, since it is so unpleasant, but you answer the "why" question well. I agree, it is in some ways more of an Austrian novel. So is Zeno, some to think of it. The situation the book describes is unpleasant, but I could not shake the remarkable comic quality of Svevo's writing: neither funny ha-ha nor funny peculiar, but a constant powerful irony that hangs in the air like the ozone smell after lightening. Somewhere I saw the book compared to Schweick. That would never have occurred to me on my own, but I can certainly see it now. The novel is also so carefully put together, so aesthetically pleasing - real literature and not just a case study. I expect get to Zeno rather sooner than later. An old man but still like the boy from "Araby". That was a strikingly unsympathetic portrait alright. I think it requires such novelistic skill to generate interest in stories centered on flawed, unlikeable characters. It would seem an almost irresistible challenge for a writer, like Svevo, who is so deeply interested in psychology: how to use art to turn a distasteful figure into someone of interest? Svevo even plays with this idea within the novel by having Emilio's sculptor friend Balli create a rather ugly bust of Angiolina's head, as though to underscore that such artistic transformations can be and often are done poorly. The original "as a man grows older" translation is significantly more enjoyable. Good to know. This is certainly a novel I plan to read again.